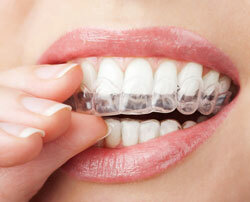 Find out why these clear aligners might be the best way to straighten your smile. Most people have already heard about Invisalign, the nearly invisible way to get a straighter smile. Of course, this is a great option for both teens and adults who want to improve the look of their smile but don’t want to do so by wearing metal brackets and wires for years. Luckily, your very own North Brunswick dentist Dr. Jyoti Shah offers Invisalign so you can now choose a simpler way to get straighter teeth. While no braces can be completely invisible, Invisalign certainly comes close with their clear aligners that are specially designed to fit your teeth. You won’t have to worry about wires or metal brackets lining your smile. Being able to get a straighter smile while also not have metal bedazzling your teeth is certainly a major advantage for both teens and adults. Sometimes traditional braces can irritate the gums and cheeks, and can even cause damage. But when you choose to get Invisalign in North Brunswick you won’t have to worry about this. While it may still take some time to adjust to your new aligners, the flexible plastic ensures that you experience greater comfort than you would with traditional braces. It can be a challenge to change up your daily routine, which will certainly happen when you get regular braces. Fortunately, Invisalign makes it easy to get the ideal smile you want without having to change your life around. Don’t want to change your diet? Then opt for Invisalign, which can be removed prior to eating and drinking. Don’t want to spend tons of time in the bathroom trying to carefully clean plaque and food from between every crevice of your braces? You won’t have to with these removable aligners. While Invisalign treatment is comparable to traditional braces for teens, we often find that many adults can get a straighter smile in less time (on average, adults can often get the results they want in about one year). Are you ready to take the plunge and get a more attractive smile with Invisalign? Then find out if you are a great candidate for treatment. Call Family Dentistry by Jyoti R. Shah DDS, today to schedule your initial consultation. North Brunswick dentist, Dr. Jyoti Shah, views her patients as more than a set of teeth and gums. She and her dedicated team seek to treat the whole person, and so, evaluate each patient for problems beyond simple tooth decay and gum disease. One of most prevalent, but often ignored, oral health problems is TMJ or TMD, a chronic inflammatory condition of the jaw joint. More properly called Temporomandibular Joint Dysfunction, TMJ affects more than 10 million adults in the United States, according to the National Institute of Dental and Craniofacial Research. Do you suspect you have TMJ? Dr. Shah answers many frequently asked questions about TMJ in her North Brunswick dental office, offering patients precise diagnosis, compassionate listening and gentle solutions to this disconcerting and painful issue. 1. What is the temporomandibular joint? The TMJ is the joint at the side of the head which allows an individual to open and close his mouth and move his lower jaw laterally, or sideways. The upper end of the jaw bone has a rounded condyle which connects to the temporal bone via special muscles and a soft disc. 2. What goes wrong with this joint? Unfortunately, many people experience facial pain, earaches, headaches, popping and clicking noises at the joint and some swelling, too. Perhaps most worrisome is the inability to open and close the jaw properly and comfortably. In fact, sometimes the mouth gets "stuck" in the open or closed position. 3. Who gets TMJ? Anyone can, but women between the ages of 30 and 40 seem most prone. 4. What causes it? Temporomandibular Joint Dysfunction is somewhat mysterious. Of course, a blow to the face may cause it, but beyond that, chronic inflammation, stress, and related teeth clenching and grinding and poor dental bite contribute to the condition. 5. How is it diagnosed and treated? Your North Brunswick dentist evaluates possible TMJ with gentle oral examination and discussion of symptoms. She may take digital x-rays and other imaging to determine how teeth bite together and to look at the jaw joint and related bone structure. 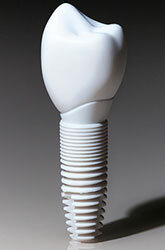 Treatment can be very simple as TMJ often just comes and goes. Ice or heat to the joint relieves discomfort as do ibuprofen, acetaminophen, or with severe pain, muscle relaxants. Cortisone injections reduce inflammation. 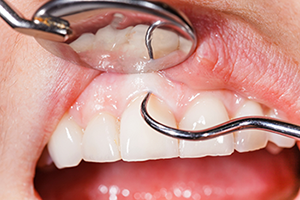 Depending on Dr. Shah's findings, dental interventions include orthodontic correction or crowns and bridgework to correct bite problems. TMJ is a quirky, stubborn oral disorder that truly impacts a person's overall well-being. If you think you have this jaw joint problem, contact Family Dentistry by Jyoti R. Shah DDS. She and her staff will get to the root of your discomfort and craft sensible solutions that work. Call (732) 246-8181 for an appointment. If your gums bleed when you brush or floss, chances are good you are in the some stage of gum disease. Gum disease is common and also treatable, but you need to get started early. If left untreated, your gum disease can progress to periodontal disease, and you can eventually lose teeth! Dr. Iyoti Shah, of Brunswick Family Dentistry in North Brunswick, New Jersey, wants you to know how to stop gum disease before it becomes more serious. Gum disease turns into periodontal disease when disease attacks the bone supporting your teeth. The toxins produced by plaque bacteria start to destroy your bone, in addition to destroying the soft tissue support of your teeth. What used to be a small crevice that you floss into, has become a deep periodontal pocket, almost impossible for you to clean. If your gum disease has progressed to periodontal disease, Dr. Shah will suggest a regimen of supportive periodontal therapy which includes more frequent cleanings, usually every 3 to 4 months. Your treatment may also include root planing, which is a systematic, thorough cleaning of deeper pocket areas, and smoothing your tooth roots. Whether you have gum disease or periodontal disease, it’s vital to seek treatment because delay can cause tooth loss! Call Dr. Iyoti Shah of Brunswick Family Dentistry, in North Brunswick, New Jersey, and get help today!